The truth is, indeed, that love is the threshold of another universe. Beyond the vibrations with which we are familiar, the rainbow-like range of its colours is still in full growth. 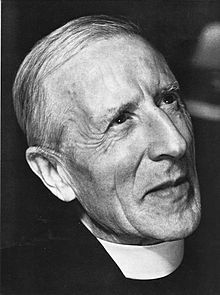 Pierre Teilhard de Chardin (1 May 1881 – 10 April 1955) was a French Jesuit priest, philosopher, and a paleontologist present at the discovery of Peking Man. What paralyzes life is lack of faith and lack of audacity. The difficulty lies not in solving problems but expressing them. There is neither spirit nor matter in the world; the stuff of the universe is spirit-matter. Receive, O Lord, in its totality the Host which creation, drawn by your magnetism, presents to you at the dawn of a new day. Mankind is now caught up, as though in a train of gears, at the heart of a continually accelerating vortex of self‑totalisation. Christ has a cosmic body that extends throughout the universe. Science will, in all probability, be increasingly impregnated by mysticism. I am far from denying the destructive and disintegrating forces of passion. I will go so far as to agree that apart from the reproductive function, men have hitherto used love, on the whole, as an instrument of self-corruption and intoxication. But what do these excesses prove? Because fire consumes and electricity can kill are we to stop using them? The feminine is the most formidable of the forces of matter. True enough. "Very well, then," say the moralists, "we must avoid it." "Not at all," I reply, "we take hold of it." In every domain of the real (physical, affective, intellectual) "danger" is a sign of power. Only a mountain can create a terrifying drop. The customary education of the Christian conscience tends to make us confuse tutiorism with prudence, safety with truth. Avoiding the risk of transgression has become more important to us than carrying a difficult position for God. And it is this that is killing us. "The more dangerous a thing, the more is its conquest ordained by life": it is from that conviction that the modern world has emerged; and from that our religion, too, must be reborn. The truth is, indeed, that love is the threshold of another universe. Beyond the vibrations with which we are familiar, the rainbow-like range of its colours is still in full growth. But, for all the fascination that the lower shades have for us, it is only towards the "ultra" that the creation of light advances. It is in these invisible and, we might almost say, immaterial zones that we can look for true initiation into unity. The depths we attribute to matter are no more than the reflection of the peaks of spirit. What paralyzes life is lack of faith and lack of audacity. The difficulty lies not in solving problems but expressing them. And so we cannot avoid this conclusion: it is biologically evident that to gain control of passion and so make it serve spirit must be a condition of progress. Sooner or later, then, the world will brush aside our incredulity and take this step : because whatever is the more true comes out into the open, and whatever is better is ultimately realized. The day will come when, after harnessing the ether, the winds, the tides, gravitation, we shall harness for God the energies of love. And, on that day, for the second time in the history of the world, man will have discovered fire. "The Evolution of Chastity" (February 1934), as translated in Toward the Future (1975) edited by by René Hague, who also suggests "space" as an alternate translation of "the ether." "One day after mastering the winds, the waves, the tides and gravity" — after all the scientific and technological achievements — "we shall harness for God the energies of love. 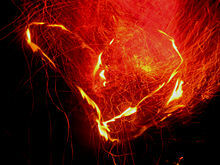 And then, for the second time in the history of the world, man will have discovered fire." Love is the only force which can make things one without destroying them. … Some day, after mastering the winds, the waves, the tides and gravity, we shall harness for God the energies of love, and then, for the second time in the history of the world, man will have discovered fire. Through the incarnation God descended into nature in order to super-animate and take it back to him. Personally, I stick to my idea that we are watching the birth, more than the death, of a World. The scandal for you, is that England and France should have come to this tragedy because they have sincerely tried the road of peace. But did they not precisely make a mistake on the true meaning of "peace"? Peace cannot mean anything but a HIGHER PROCESS OF CONQUEST. … The world is bound to belong to its most active elements. … Just now, the Germans deserve to win because, however bad or mixed is their spirit, they have more spirit than the rest of the world. It is easy to criticize and despise the fifth column. But no spiritual aims or energy will ever succeed, or even deserve to succeed, unless it is able to spread and keep spreading a fifth column. Above all I feel that you must resign yourself to taking me as I am, that is, with the congenital quality (or weakness) which ever since my childhood has caused my spiritual life to be completely dominated by a sort of profound 'feeling' for the organic realness of the World. At first it was an ill-defined feeling in my mind and heart, but as the years have gone by it has gradually become a precise, compelling sense of the Universe's general convergence upon itself; a convergence which coincides with, and culminates at its zenith in, him in quo omina constant, and whom the Society has taught me to love. Since once again, O Lord, in the steppes of Asia, I have no bread, no wine, no altar, I will raise myself above those symbols to the pure majesty of reality, and I will offer to you, I, your priest, upon the altar of the entire earth, the labor and the suffering of the world. Receive, O Lord, in its totality the Host which creation, drawn by your magnetism, presents to you at the dawn of a new day. This bread, our effort, is in itself, I know, nothing but an immense disintegration. This wine, our anguish, as yet, alas! is only an evaporating beverage. But in the depths of this inchoate Mass you have placed — I am certain, for I feel it — an irresistible and holy desire that moves us all, the impious as well as the faithful to cry out: "O Lord, make us one!" However convergent it be, evolution cannot attain to fulfilment on earth except through a point of dissociation. With this we are introduced to a fantastic and inevitable event which now begins to take shape in our perspective, the event which comes nearer with every day that passes: the end of all life on our globe, the death of the planet, the ultimate phase of the phenomenon of man. To the cosmic corpuscles we should find it natural to attribute an individual radius of action as limited as their dimensions. We find, on the contrary, that each of them can only be defined by virtue of its influence on all around it. Whatever space we suppose it to be in, each cosmic element radiates in it and entirely fills it. However narrowly the heart of an atom may be circumscribed, its realm is co-extensive, at least potentially, with that of every other atom. This strange property we will come across again, even in the human molecule. A universal love is not only psychologically possible; it is the only complete and final way in which we are able to love. If there were no internal propensity to unite, even at a prodigiously rudimentary level — indeed in the molecule itself — it would be physically impossible for love to appear higher up, with us, in hominized form. . . . Driven by the forces of love, the fragments of the world seek each other so that the world may come into being. Is evolution a theory, a system or a hypothesis? It is much more: it is a general condition to which all theories, all hypotheses, all systems must bow and which they must satisfy henceforward if they are to be thinkable and true. Evolution is a light illuminating all facts, a curve that all lines must follow. All the communions of all men, present, past and future, are one communion. God is inexhaustibly attainable in the totality of our action. We are like soldiers who fall during the assault which leads to peace. All the communions of a life-time are one communion. All the communions of all men now living are one communion. A breeze passes in the night. When did it spring up? Whence does it come? Whither is it going? No man knows. The creative act is comprehensible only as a gradual process of arrangement and unification, which amounts to accepting that to create is to unite. And, indeed, there is nothing to prevent our holding that union creates. Love is the internal, affectively apprehended, aspect of the affinity which links and draws together the elements of the world. ... Love, in fact, is the expression and the agent of universal synthesis. In its most general form and from the point of view of physics, love is the internal, affectively apprehended, aspect of the affinity which links and draws together the elements of the world, centre to centre. This is how it has been understood by the great philosophers from Plato, the poet, to Nicolas of Cusa and other representatives of frigid scholasticism. Once this definition has been accepted, it gives rise to a series of important consequences. Love is power of producing inter-centric relationship. It is present, therefore (at least in a rudimentary state), in all the natural centres, living and pre-living, which make up the world; and it represents, too, the most profound, most direct, and most creative form of inter-action that it is possible to conceive between those centres. Love, in fact, is the expression and the agent of universal synthesis. Variant: We are not human beings on a spiritual journey. We are spiritual beings on a human journey. The above "quotation" can be considered a paraphrase of Hegel's dictum that matter is spirit fallen into a state of self-otherness. The astonishing resonance of his research, as well as the brilliance of his personality and richness of his thinking, have profoundly marked our epoch. In him, a powerful poetic intuition of nature's profound value, a sharp perception of creation's dynanism, and a broad vision of the world's future join together with an incontestable religious fervor. Similarly, his unremitting desire to dialogue with the science of his time and his bold optimism about the evolution of the world have given his intuitions — through the rich variety of his words and the magic of his images — considerable influence. Completely turned to the future, this synthesis, often lyrical and animated with passion for the universal, will help to restore hope to those assailed by doubts. … What our contemporaries will undoubtedly remember, beyond the difficulties of conception and deficiencies of expression in this audacious attempt to reach a synthesis, is the testimomy of the coherent life of a man possessed by Christ in the depths of his soul. He was concerned with honoring both faith and reason, and anticipated the response to John Paul II's appeal: "Be not afraid, open, open wide to Christ the doors of the immense domains of culture, civilization, and progress." In his own poetic style, the French Jesuit Teilhard de Chardin liked to meditate on the Eucharist as the firstfruits of the new creation. In an essay called The Monstrance he describes how, kneeling in prayer, he had a sensation that the Host was beginning to grow until at last, through its mysterious expansion, "the whole world had become incandescent, had itself become like a single giant Host." Although it would probably be incorrect to imagine that the universe will eventually be transubstantiated, Teilhard correctly identified the connection between the Eucharist and the final glorification of the cosmos. It can be said that he applied his whole life, his tremendous intellect and his great spiritual faith to the concept of building up a philosophy that would reconcile Christian theology with the scientific theory of evolution, that would relate the facts of religious experience to those of natural science. The Phenomenon of Man is Pierre Teilhard's most important book and contains the quintessence of his thought. Its subject could be described as the surging evolution of the world from the primal stuff of the universe, through life, to consciousness and man. This leads to a further passage in Teilhard de Chardin that is worth quoting in order to give at least some indication here, by means of a few fragmentary excerpts, of his general outlook. "The Universal Energy must be a Thinking Energy if it is not to be less highly evolved than the ends animated by its action. And consequently … the attributes of cosmic value with which it is surrounded in our modern eyes do not affect in the slightest the necessity obliging us to recognize in it a transcendent form of Personality." Hardly anyone else has tried to bring together the knowl­edge of Christ and the idea of evolution as the scientist (paleontologist) and theologian Fr. Pierre Teilhard de Chardin, S.J., has done. … His fascinating vision … has represented a great hope, the hope that faith in Christ and a scientific approach to the world can be brought together. … These brief references to Teilhard cannot do justice to his efforts. The fascination which Teilhard de Chardin exer­cised for an entire generation stemmed from his radical man­ner of looking at science and Christian faith together. Man occupies a special place in the Cartesian scheme. He alone is endowed with mind. Descartes believed that animals did not possess one, that they were simply extremely complicated automatons. Other thinkers have rejected this point of view and proposed to endow all matter in the universe — living or inanimate — with consciousness. This "panpsychism" has been promoted by, among others, Teilhard de Chardin and, more recently by the British-American physicist Freeman Dyson, who holds that mind is present in every particle of matter. "There are really only two ways, it seems to me, in which we can think about our existence here on Earth. We either agree with Macbeth that life is nothing more than a 'tale told by an idiot,' a purposeless emergence of life-forms including the clever, greedy, selfish, and unfortunate species that we call homo sapiens - the 'evolutionary goof.' Or we believe that, as Pierre Teilhard de Chardin put it, 'There is something afoot in the universe, something that looks like gestation and birth.' In other words, a plan, a purpose to it all."